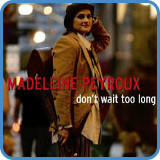 In 2004, Madeleine Peyroux launched herself as a contemporary answer to Billie Holiday. She strummed chord progressions like I – VI – II – V in a jazz style and added some interesting extensions and slash chords. ‘Don’t Wait Too Long’ is played in a style that people may refer to as “jazz standard” territory. As an introduction to that world, this is definitely a simple enough song to get you started. In the advanced guitar course, we improvise over this song after we have learned exactly what’s going on in the video lesson. When you solo in this style it is essential to swap mode and arpeggio for every chord. To do this, you must think in chord numbers and modal scales. This means you play Phrygian Dominant for chord IIIx and Aeolian for chord VIm7 , for example. The bridge section uses the cycle of 4th moving: IIIx – VIm7 – IIx – V7sus4 – I. This is perfect to practise modal scales over. If you don’t know all of your pentatonic scales, arpeggios and modes in each shape, you will never be able to relax enough to play a jazz solo with a smile on your face. When you do know, jazz is easy, you play around with melodies like a footballer plays around with his ball. Similarly to ‘Baby Won’t You Please Come Home‘, ‘Don’t Wait Too Long’ uses jazz comping based on consistent downward strumming on the beat. Against this straight beat, you apply back strums to indicate how much you’re swinging. A good trick is to apply the off beats more frequently, in between vocal lines. Once you get the feel of the swing i.e. how far you stretch the ‘up’ strum from the ‘on the beat’ strum’, start looking at variations of when to put this in. Take the advanced course and everything in the video is explained using TAB. You’ll also learn how to improvise using the technique of new chord = new scale or arpeggio. For complete lyrics, go to Don’t Wait Too Long lyrics.